IMG_3597.JPG, a photo by Southworth Sailor on Flickr. Arriving at JFK airport at 6 am after a five hour flight from LA with just winks of sleep was hardly a way to start a day of sightseeing. The NY morning broke into a bright October summer day. 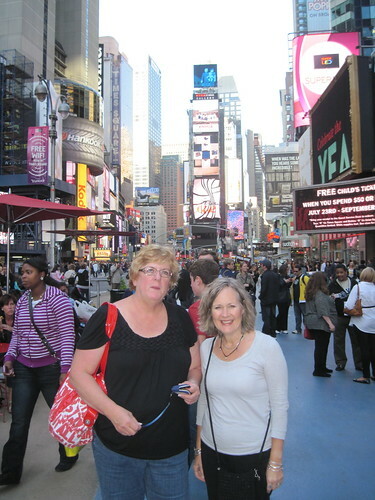 We had traveled from Seattle with Jack and Sue, and we met Ellen at the airport before riding the subway to Midtown and Hephzibah House where we stored our luggage for the day. Jack had a handle on the NYC public transit system having been here a couple of times; which turned out to be very helpful. We purchased unlimited weekly passes, which paid for themselves by the visit’s end. We spent the afternoon walking around Central Park and getting used to being in the city. I had anticipated some beautiful Fall colors in the park but everything was still green. We ate a diner before catching the subway to Time Square area where we explored a little and then caught the chartered bus for our trip up the Hudson Valley to Belvedere Mansion. For some reason the bus driver drove up Broadway and straight through Uptown rather than crossing over to Jersey and catching the freeway north. The two hour ride turned into a three hour ride, but we got to experience the traffic mess of NYC exiting town for a long weekend. We arrived at Belvedere Mansion to pizza and pumpkin carving. It was great to see everyone, and the soft bed felt really good after 36 hours.